Even though I am constantly trying new skincare products for the blog, I do tend to have a few transitions that I make twice a year. I think if I lived in a warmer climate with year-round consistent temperatures, I would keep many of the same products. But living in NYC, our winters can be brutal and summers almost unbearable, so I do need to switch out/add in a few products to help my skin deal with those changes. For the winter that means adding in richer, more nourishing products that help to heal, hydrate and protect. Since the temperatures haven't plummeted just yet, I am easing into these slowly so my reviews for these are going to be more from a first impression stand point, and I will give more detailed updates as the months go on. 2. 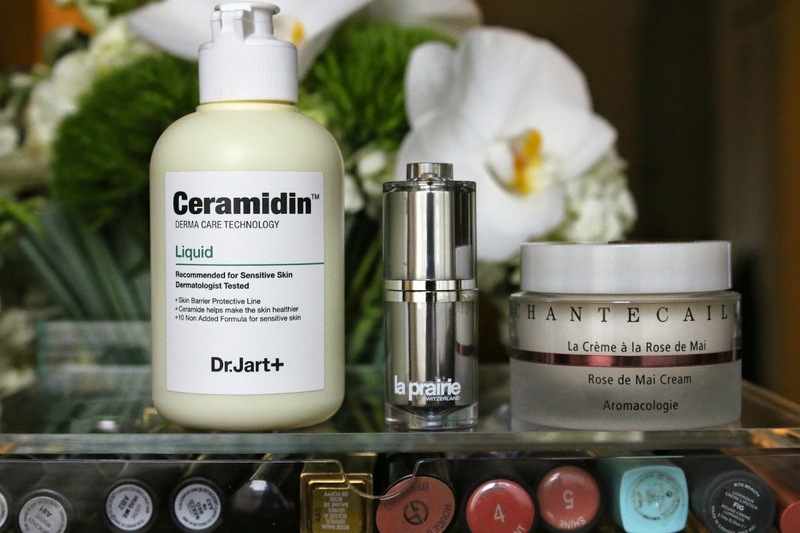 Dr. Jart Ceramidin Liquid - I know you are beginning to see a theme here with my picks - hydration, hydration, hydration. Even though my skin is incessantly oily, it can become dehydrated so quickly - especially in the winter. The Ceramidin Liquid is one of the thinnest serum textures I have ever tried, which surprised me immediately. Most serums have some slip to them or tackiness that can remain on the skin. Not this Ceramidin Liquid - it felt like I was applying water to my skin, it was that thin. Almost thin enough to be layered with another serum, which is great for those that love to layer. *raises hand* And for all you sensitive skin gals and guys, I've read this Ceramidin Liquid is a sensitive skin savior. 3. La Prairie Cellular Eye Essence Platinum Rare - Now that I've sufficiently covered the bases for my face, the final skincare addition is for the eyes. The fact that this is an essence that can be layered under any eye cream (currently I am going back to this for the winter) makes it more appealing to me because I know I can get stronger results. I frankly couldn't wait until winter to begin testing this so I have already added it into my routine, and first impressions are quite impressive. The texture is thin but rich and gives the eye a soothing effect while tightening at the same time. It's truly unique. After the first few nights of using this essence, I noticed a remarkable difference in the way my eyes looked when I woke up. Fine lines were barely noticeable, eyes were hydrated and a lot less puffy. Hallelujah! And then I began adding it into my morning routine as well and that's when I saw the strongest difference. My eye area was brighter (the essence itself has an iridescent finish), smoother and more hydrated which made it almost unnecessary to wear concealer. If this is how I feel after just a few weeks, I can only imagine what my eyes are in for this winter. For reference, this is a .3oz sample size they sent to me, and the full size is .5oz. It should also be noted that I barely use a full drop for both eyes so I can imagine a full size bottle would last me a very long time, which is an important point when deciding to invest in a pricey skincare item. Do you transition your skincare routine from season to season? Why or why not?